blued loading gate, and Winchester Model 62B folding tang peep sight. 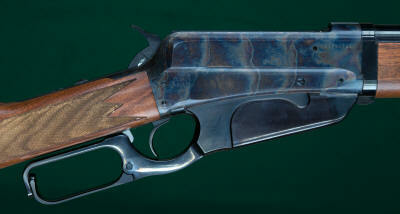 entire final chapter of Hughes' "Custom Rifles in Black & White", 1999.
grained walnut with crescent steel buttplate. Casehardened hammer and lever. receiver blue. No extra holes. Excellent bore. Factory letter.